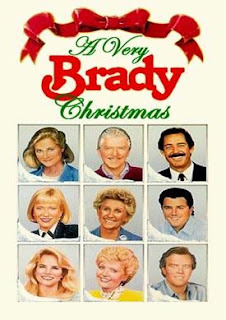 This week's Theater Thursday, Christmas theme film is A Very Brady Christmas. Yes, that's right. The Brady Family made a Christmas movie! All of the original cast is back (except for Cindy)! 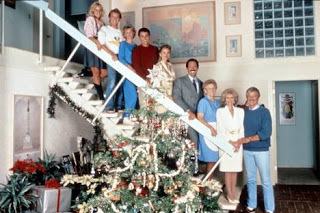 Made in 1988, Carol and Mike Brady try to decide where to take a vacation for the holiday season. After a mishap with money and with the wish of an old fashioned Christmas the Brady's decide to fly all of their kids and families into town. Unbeknownst to everyone except Alice, all of the kids are having some kind of trouble or issue in their life. However, they individually decide to put on a brave face and come home to celebrate Christmas with their family, keeping their problems to themselves.....maybe. Sadly there is no Marcia, Marcia incident but there is a serious moment in the Brady household that could ruin Christmas and threaten the well being of one family member. You can't miss this movie! It's a true Brady Classic and a Christmas pleaser! Ha! I totally remember watching this movie as a child! It's definitely a classic and I love that you're going with the Christmas theme! I CANNOT wait for the holidays to get here! I can't wait for Christmas - 99 days! GREAT movie!! I love all Christmas movies. When do they start!?! can't say i've ever seen this movie but i used to love the b.bunch. I love the brady bunch! I tivoed all of the episodes and am no currently working my way through them all! I have never heard of this movie! Where have I been?! Ha! I honestly always hated the Brady Bunch.... but only because my maiden name was Brady, and in school I would always get picked on for it!